(1926) Jack Pickford, Louise Fazenda, Eddie Cribbon. One of the great silent horror films. 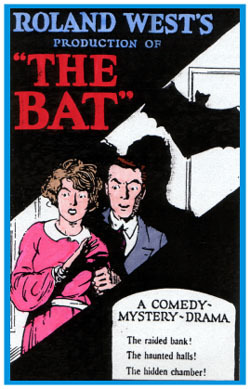 A maniacal killer dressed in a weird, bat-like costume terrorizes a group of people in a shuddery, spooky old house riddled with secret passageways. The use of miniatures and the overall cinematography is stunning for its day. An officially 'lost' film for many years. Now regarded as a horror classic. 35mm.